It's about time that a genius got treated like a pop star. Days after The Black Panther came out, Shuri had that level of fandom following her. And maybe Shuri didn't create hours worth of earworms for us to belt out with our friends but we'd still buy front row tickets to her show. She could teach us a little bit about Wakandan technology. Okay, maybe a tour is a little much. Like all superstars, sixteen-year-old Shuri has a lot on her hands now that Wakanda is opening up to the rest of the world. She's got to explain a few things to the outsiders. She can finally explain that new tech can be used for things outside of weapons to the MCU. Like shipping, public transportation, and sneaky sound absorbing shoes. We're just going to drop a hint here. Shuri, if you need help, we totally don't mind interning for a teenager! Just allow us to hang out with you and we can retire happy. You don't have to be a sci-fi level engineer to figure out this simple Shuri ensemble. The deep blue jumpsuit has high-tech looking highlights printed throughout. The flexible fabric allows you to move while the hip scarf makes you feel comfortable in all sort of settings from themed parties to dancing in a club. With arm details and white face paint details, you'll be ready to defend Wakanda in no time! Shuri sticks out in many ways. If it wasn't for Vibranium, we're sure she'd make a great comedian, inventor, doctor, or even fashion designer. But one thing is certain, she's changing up the game and making genius cooler than ever. 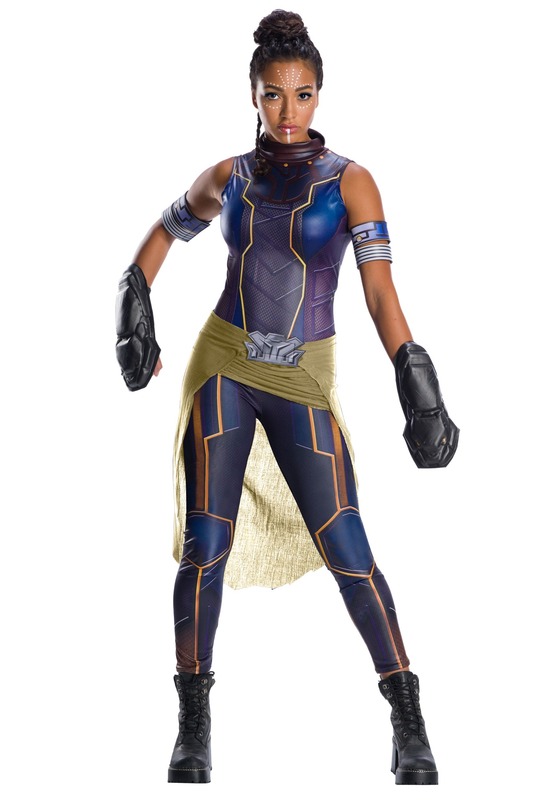 Soak up that fashionable nerd vibe with this lovely Shuri costume. Whether you're teaming up with T'challa and other MCU heroes or you're heading out solo when you're wearing this ensemble, you're sure to look smart!